President Trump reacts after addressing a joint session of Congress in 2017. "This is our New American Moment. There has never been a better time to start living the American dream," the president will also say. "I want to see our country united," Trump told network anchors at a luncheon Tuesday previewing the speech. "I want to bring our country back from a tremendous divisiveness," which he said dates back many years. Sixty-one percent of Americans believe Trump has done more to divide the country than to unite it, according to a recent NPR/PBS NewsHour/Marist poll. A year into office, Trump's approval ratings are at record-low levels, and a majority of Americans see his first year as a failure. 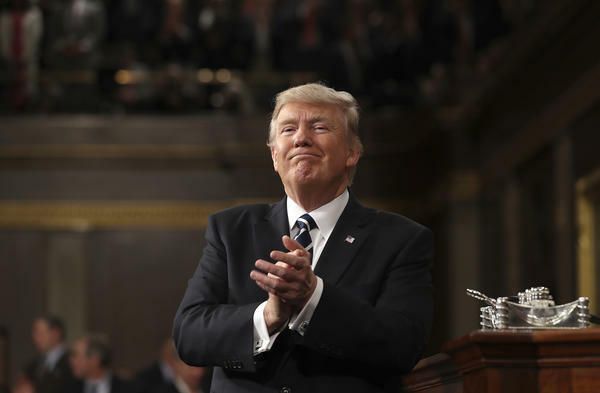 A scripted speech like the State of the Union, with dedicated airtime, gives Trump a prime opportunity to lay out his agenda and try to set a new tone. The theme of the speech will be "building a safe, strong and proud America," a senior administration official told reporters, and the president will tout his "record-setting" accomplishments, which are "lifting all Americans." The speech will reflect on his first year in office and highlight the country's economic upswing. The official said the speech will be forward-looking and optimistic, much in the vein of Trump's first address to Congress in February 2017, shortly after he was inaugurated, when he called for the "renewal of the American spirit." Tuesday night, Trump is expected to focus on five major policy areas: jobs and the economy, infrastructure, immigration, trade and national security. The president is expected to unveil some new policy proposals, though the official would not elaborate on what those would be. The economy will be a major facet of Trump's look back. The president will tout the tax law passed in December by Congress, his administration's deregulation efforts and previous stock market gains. In the NPR poll, 45 percent of Americans said the economy has improved under Trump, who inherited an upward economic trajectory from former President Barack Obama. The economy didn't grow as quickly in the final quarter of 2017 as many economists had projected, though. And the stock market's triple-digit tumble on Tuesday just hours before Trump's speech will certainly cast a pall over any Wall Street highs that the president could tout. 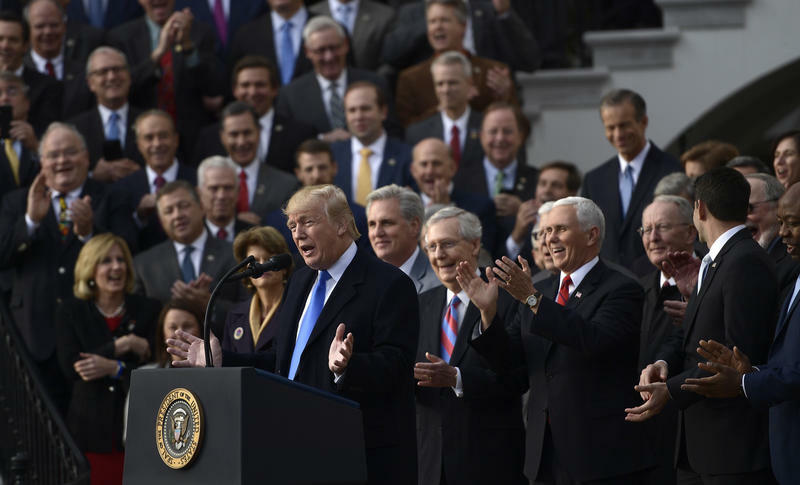 Still, if the economy overall does remain strong, that is one mark that can work in the president's favor, and Republicans — especially heading into the 2018 midterms — hope that bonuses and higher paychecks resulting from the tax law will help boost voters come November. "Since we passed tax cuts, roughly 3 million workers have already gotten tax cut bonuses — many of them thousands of dollars per worker," Trump will say, according to excerpts. On infrastructure, the president will outline his $1 trillion plan to rebuild the country's roads, bridges and more — something he has long hoped to champion in Congress. Such an effort could draw bipartisan support but has so far lacked specifics. "America is a nation of builders. We built the Empire State Building in just one year — isn't it a disgrace that it can now take 10 years just to get a permit approved for a simple road?" Trump will ask Congress. Immigration will also be a critical component, with the White House proposing to offer protections for people in the Deferred Action for Childhood Arrivals program, which is set to expire March 5. Under the plan outlined to congressional Republicans this week, the White House would support a 10- to 12-year path to citizenship for the roughly 700,000 undocumented immigrants currently enrolled in DACA who came to the country as children. The proposal would also offer that path to others who were eligible for DACA but not currently enrolled, which could be up to 1.8 million people in total. In his lunch with television anchors, Trump said he empathizes with the DACA recipients. "I put myself in their position. Millions and millions of people are affected," Trump said. He suggested that is one of the things he has learned during his first year in office. "You govern with all the instincts of a businessperson but you have to add much more heart and soul into your decisions than you would ever have even thought of before." The White House also wants $25 billion for Trump's proposed Southern border wall and other border security measures, along with an end to the visa lottery system and changes to policies by which immigrants legally in the U.S. are allowed to sponsor extended family members. Those cuts to legal immigration in exchange for a DACA deal have been a nonstarter for many Democrats. At the same time, many in the president's conservative base are upset that he would offer any path to citizenship for DACA recipients and the broader group of immigrants known as DREAMers. Trump will also talk about trade, which has been a key part of his populist platform and a theme of past speeches, including recently at the World Economic Forum in Davos, Switzerland. On Friday, Trump defended his "America First" approach to trade, saying that while the U.S. supports free trade, "it needs to be fair and it needs to be reciprocal." Trump pulled out of the Trans-Pacific Partnership trade deal when he came to the White House. His administration is also working on renegotiating the North American Free Trade Agreement; Trump has, at times, suggested leaving NAFTA altogether. The president is expected to touch on themes similar to his Davos speech and to the remarks he gave last November at the Asia-Pacific Economic Cooperation CEO Summit, where he said, "The United States will no longer turn a blind eye to violations, cheating, or economic aggression. Those days are over." "America has also finally turned the page on decades of unfair trade deals that sacrificed our prosperity and shipped away our companies, our jobs and our nation's wealth," Trump will say, according to the excerpts. The final key part of Trump's speech will focus on national security, including efforts to rebuild the military and deal with foreign threats such as ISIS — another effort where he has received positive marks from Americans — North Korea and others. "Last year I pledged that we would work with our allies to extinguish ISIS from the face of the earth," the president will say. "One year later, I'm proud to report that the coalition to defeat ISIS has liberated almost 100 percent of the territory once held by these killers in Iraq and Syria. But there is much more work to be done. We will continue our fight until ISIS is defeated." On North Korea, Trump has a record of using controversial rhetoric, including taunting North Korean Leader Kim Jong Un as "Little Rocket Man" and comparing the size of the countries' "nuclear buttons." Historically, few promises that presidents lay out in these speeches ever get implemented, as PBS NewsHour noted in 2015. The speeches rarely change anyone's minds, either, Gallup reported in 2010: "Audiences for the State of the Union tend to be heavily tilted toward the president's existing supporters." And while Trump will have an unfiltered platform to lay out his agenda, any proposals or promises to reach across the aisle could be undone by a tonal change in a tweet or in unscripted remarks. Just days after last year's call for unity before a joint session of Congress, for example, Trump tweeted — without any evidence — that Obama had wiretapped his home in Trump Tower. NPR White House correspondent Tamara Keith and NPR political editor Domenico Montanaro contributed to this report. 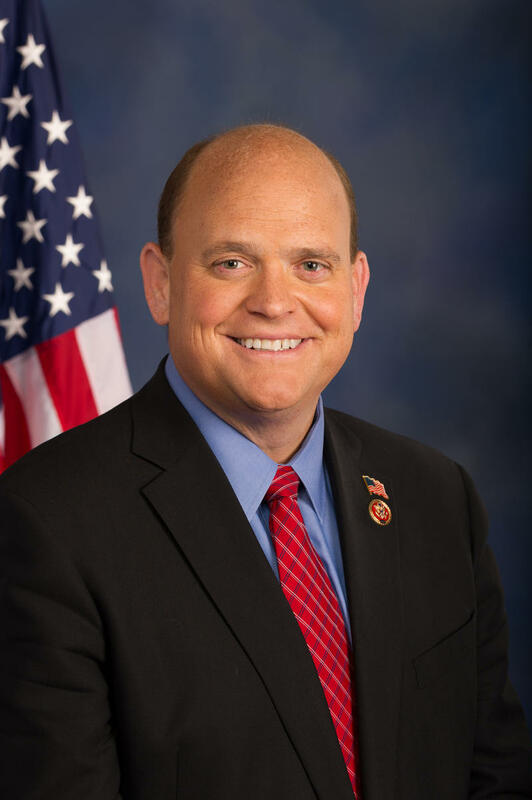 Congressman Tom Reed says there is bipartisan agreement in Congress on improving the nation's infrastructure. It's MORNING EDITION from NPR News with Linda Wertheimer. I'm Renee Montagne.